She was 10 Months old when the great earthquake of 1907 flattened Kingston. The family had to stay in tents at what was then the Kingston Race Course. She attended Chetolah Park Elementary School, but because she was very sickly as a child she could not attend school regularly. She had only four years of formal schooling from 1918 when she was 12 years old until she left school at age 16. She was nonetheless numerate and literate. Perhaps because of her own shortened school life she always emphasized education for her children. She was a hard worker and very proud of the fact that she was not afraid to work hard. She worked for many years at the Kingston packing house (it may have been owned by United Fruit Co – not sure), packing oranges and other citrus fruits when these were in season. She only gave it up when the processing plant was moved to Bog Walk in St. Catherine. She sold produce such as peas, scallion, thyme and cooking oil in the market. She would travel by market truck on weekends to the May Pen Market in Clarendon. She later changed from selling agricultural produce to making clothes which she sold at the same venue. She was lactose intolerant regarding cow’s milk, but could tolerate goat’s milk. She did not eat any of the following fish pickled in brine, which were staples of the Jamaican diet - mackerel, shad, and herring, as well as “sprats” some small fish, a very popular “nine night” favourite . She had bunions on both feet which made it difficult for her to wear shoes, so she mostly wore sandals. 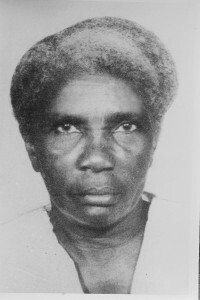 She loved court room dramas, and would spend many hours sitting as a spectator in the courts listening to cases, particularly murder cases, especially when the eminent lawyer Norman Washington Manley was the trial lawyer. (Despite her limited education, she had an uncanny knack for sifting through evidence and deciding the innocent or guilt of an offender, before the trail was over, yet she never served as a juror). She worshipped at All Saints Anglican Church on Lower West Street in Kingston. She died suddenly of a brain hemorrhage at age 64 of untreated High Blood Pressure. She was buried at the May Pen Cemetery in Kingston.